Written by experienced classroom practitioners who are experts in the field of psychology, Psychology in the Classroom provides a thorough grounding in the key principles of psychology and explores how they can be applied to teaching and learning. It draws on both classic and cutting-edge research, offering practical advice on commonly overlooked or misunderstood concepts that contribute to positive academic outcomes. It aims to show the value of psychology in enabling teachers to make and justify everyday classroom decisions. Designed to equip teachers with the skills to identify and tackle common issues that affect students' learning, each chapter highlights key areas of research and discusses how lesson planning and material design can be informed by the psychological concepts presented. It covers core areas essential for improving learning, including:memory and understanding;creativity; motivation;independent learning; resilience; cognition; andself-theories and mindsets. Full of advice and strategies, Psychology in the Classroom is aimed at both new and experienced teachers, across primary, secondary and post-16 education, providing them with practical ways to apply these psychological principles in the classroom. 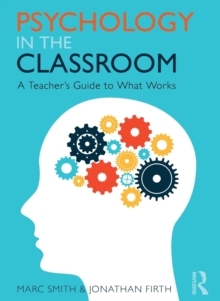 With an emphasis on understanding the theories and evidence behind human behaviour, this book will allow you to reflect critically on your own classroom practice, as well as making simple but valuable changes.